Today ended up very differently than I expected. 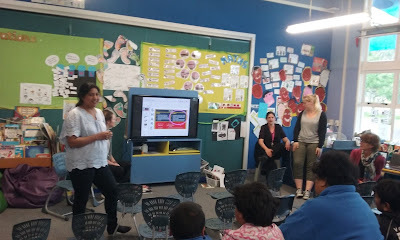 We had a presentation for year 3 parents on the school overview, that nobody seemed to know what was happening with. Archana has never done one of these information evenings before, so we decided to have a look at it together. I created a presentation and Archana and I worked on it together on Monday night. As neither of us had done this kind of presentation before, and there was no previous example to look at, we did feel a bit lost and just did what we thought would be best. Archana linked in lots of great examples of students 'create' work, especially on slides 17 & 18 which show powerful meaning ways that students use their chromebooks for learning. The presentation went well, I felt it was very awkward at first as we all were a bit unsure of how it was going to go. I really liked the team approach we took to presenting - Archana and myself took turns to talk to the slides, Juliana clicked through them for us, and Rhonda and Sally added in whenever they felt we had missed something. We were also mostly either sitting or leaning as well (rather than standing) which I felt made it more comfortable for parents as it was more equal in approach, not a dominating approach. I do feel that it was a little lecture-y, and could have been more collaborative to really make the parents feel comfortable and that they could ask questions, talk to each other to clarify understandings etc. 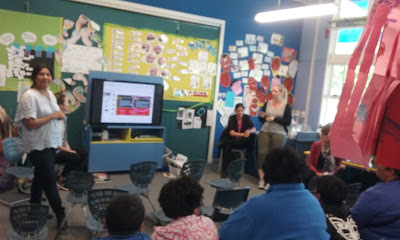 I never thought I would be presenting to parents in my first year of teaching, but it wasn't as scary as I thought it would be. Next year I also think it would be beneficial to do multiple of these events, at varying times (e.g. one at 6pm, one at 3pm), and begin them earlier in the year (term 3) so parents can organise their payments etc before the christmas boom arrives.